Last night I was observed as data for the ALFALFA survey. The observer wrote all about it here. This morning, before I even had a chance to get used to being data, I started being transferred from Arecibo (warm and sunny) to Cornell University (not so warm and sunny). It takes a while for me to arrive fully – during the night I grew by about 1 Gb per hour, so there is a lot of me to travel along the internet trunks from Puerto Rico to Ithaca. Finally, there’s a whole copy of me in Ithaca. I find out that I’m considered Level 0 data right now. The first thing that is going to happen to me is that I’ll be processed to become Level 1 data. This process actually takes a while, but the first part will happen today. The first thing that happens is I’m calibrated. This is where I go from being in units measured by the telescope (a ‘temperature’) to units used by astronomers (the Janksy). Since a calibrator of known signal was fired every ten minutes last night during the observing, the records of the calibrator can be used to convert from telescope units to the flux units of interest. After I’m calibrated, it’s time for ‘bpd’. This step is a bandpass correction. The filter on the telescope that allows the frequencies of interest through isn’t exactly flat. During this step, any frequency-dependent response I may have is removed. My fluxes are scaled so that the same signal strength on the sky corresponds to the same flux in the data file. Now I’ll wait for the next step, flagging, after which I’ll be Level 1 data. I mentioned in my recent post on astronomy and astrophysicists that I consider myself an astronomer because of the emphasis I place on observations and data in my studies. While working on a large survey, it’s not surprising that data would have such a large focus for me. It seems only fair to share the awesomeness and fun of working with all this data. This post will be a general timeline for the data processing, and follow-up posts will go into more details for each step. Day 0: The data is observed at Arecibo. Day 1: The data is transferred from Arecibo to Cornell. The initial calibrations are done. Day N ( ): The data is flagged to mark all the radio frequency interference (RFI). Day X ( ): The data is ‘gridded’ – three-dimensional cubes are produced and source extraction begins. Day Y ( ): Source extraction is complete for a strip of sky and the source catalog is officially published. What exactly is the difference between astronomy and astrophysics? This is a topic that has come up a few times recently in conversation, so it has been on my mind. There’s no one right answer to this question – every astronomer/astrophysicist will have a varying opinion. It’s a fun discussion to have, so I thought I’d start it off. If you have different definitions for astronomy and astrophysics, leave it in the comments. For me, the distinguishing characteristic between astronomy and astrophysics is the emphasis on the data. Astronomy is about observations and data – from designing an observing plan to careful reduction of data. The goal is to observe interesting sources in order to garner new knowledge. Astrophysics is the application physics of to understand astronomical sources. Here, the emphasis is on detailed calculations to explain the specifics of various astronomical processes. Those are the over-arching definitions I use, but they are rather vague. And, as you can probably easily see, there is a grey area between astronomy and astrophysics – when do you go from doing astronomy to astrophysics? Below is an example with my differentiation. I’m observing for ALFALFA? Astronomy. Flagging ALFALFA data to mark bad spots with interferences? Astronomy. Extracting and measuring the basic properties of ALFALFA sources? Astronomy. The terms astronomy and astrophysics are often used interchangeably because of this smooth transition from one to the other – most astronomers/astrophysicists do both astronomy and astrophysics. (There are some theoretical astrophysicists who never work with data. I’m sad for them although they seem happy.) Personally, I consider myself an astronomer; for me, the driving aspect (and fun part) of my studies is observing and working with data. I do astrophysics in order to understand sources I observe, but I don’t consider myself an astrophysicist. I promised earlier this week to talk a little bit more about how radio telescope arrays work, and I try to keep my promises. If anything in this explanation isn’t clear, feel free to ask questions. Now, you might think that since radio telescopes don’t have to worry about atmospheric blurring, they would offer good resolution. However, the wavelength difference between radio and optical wavelengths is substantial. Typical resolution limits achieved for optical telescopes are on the order of one arcsecond. (There are sixty arcseconds in one arcminute and sixty arcminutes in one degree. The moon and sun are both about half a degree across.) Arecibo, the largest single dish radio telescope, has a resolution of about 3.5 arcminutes at a wavelength of 21 cm (which is where we observe). This is almost 200 times worse than the resolution one would have with a small optical telescope. In order to achieve comparable resolution at 21 cm, you would need a radio telescope with a diameter of over 40 km. Clearly, building such a telescope is not feasible. Radio astronomers wanted a way to achieve good resolutions, though. Since it’s not possible to build a single telescope large enough to achieve high resolution, they came up with the idea of using multiple smaller antennas to synthesize a larger dish. This is the motivation behind the VLA and other radio telescope arrays. Some number of telescopes work together, observing the same source. The signals from the separate telescopes are then combined and processed so that you can produce an image with a resolution set by the largest baseline (separation between any two dishes) rather than the size of the radio dishes. This means that you don’t need one giant dish; rather, you can have lots of smaller (and cheaper) telescopes spread over a large area. Now, the details of how you combine the data and process it are quite complicated – that’s part of the reason why I’ve been in Socorro for the past few days. In fact, a Nobel Prize was awarded to Martin Ryle and Tony Hewish for figuring out the details of this process and how to reconstruct an image. Therefore, I’m not going to go into the details of how this process works. Rather, I’m going to be happy that it does work. Array observations are very interesting because they offer a nice complement to observations with large single dish telescopes. Arecibo is much more sensitive (can see fainter objects) than the VLA, but the VLA offers much better spatial resolution (objects aren’t as blurry). This means that ALFALFA can identify interesting faint galaxies, and follow-up observations with the VLA can help to determine the structure of these galaxies. I hope to explain a little bit more about how radio telescope arrays work later in the week, but I don’t want to delve into that topic right now. Instead, I’ll talk about what I’m doing in Socorro. Now, this trip is not exciting as you might think (except for the fact that I’m not in Upstate New York in February). The VLA is actually about a hour’s drive from Socorro, so I haven’t even seen the telescope yet. Of course, there are advantages to not being at the telescope site, such as being able to use a microwave. (Those are a no-no on-site as they produce radiation at wavelengths that the telescope observes at.) We do plan to make the time for a trip out to the VLA, as it would be nice to see the array that we’re using. Of course, this isn’t an observing trip, either, which also removes some excitement (in the form of time pressure). I’m out here to learn how to reduce data that was taken a couple of months ago. (It’s actually for a non-ALFALFA project, but I will hopefully have time to also reduce some follow-up VLA observations of ALFALFA galaxies. And if not, I’ll be bringing my skills back to Ithaca.) It’s actually not unusual for observers to travel to Socorro for reduction but not observations. Partially, this is due to the nature of observing with the VLA; an observing plan is submitted to the telescope operator and does not require the presence of an observer. However, dealing with data from arrays is challenging because you need to combine the information from all the different antennas. Originally, the limitations were on computing power; people traveled to Socorro for access to computers that were powerful enough to handle the data processing. Currently, travel reasons have more to do with expertise. By traveling out here, I’m able to learn how to use this program from an expert, which means much less time spent trying to understand the manual. This is especially helpful, as the program used to reduce VLA data ( AIPS – Astronomical Imaging Process System) was first developed in the 70’s and has many quirks that are best learned from someone familiar with it. This process of learning from an expert has worked well, as we had a rough map of our data by the end of today – our first day! The map above is a projection of the sky with coordinate lines of right ascension and declination. The blue areas represent the planned survey coverage of ALFALFA. 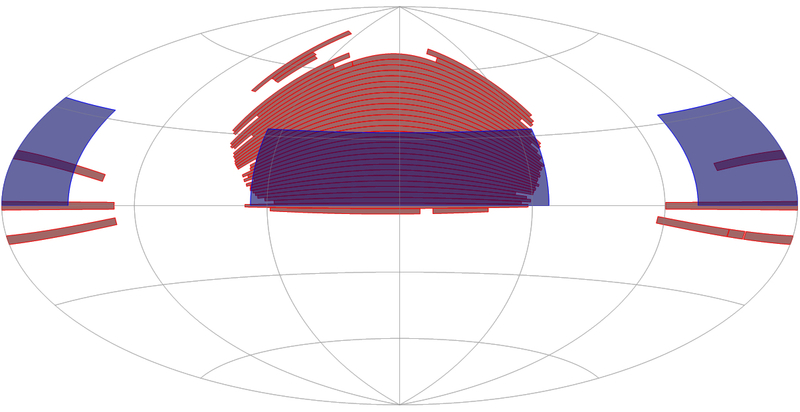 The red shows the coverage of the Sloan Digital Sky Survey (SDSS), an optical survey that has photometry and spectroscopic redshifts for hundreds of thousands of galaxies. The SDSS footprint (sky coverage) is shown for comparison purposes. Where there is overlap, we’ll be able to use the two datasets in a complementary manner. The declination limits on the survey are placed mostly by the telescope itself; Arecibo can only look so far away from zenith (straight overhead). Arecibo is located at about 18 degrees latitude, so we are looking about 18 degrees north and south of zenith. The R.A. ranges are designed both to include interesting local structures (discussed here) and to avoid the Galactic Plane, as there are lots of other astronomers who study our own Galaxy and use Arecibo to observe that part of the sky. A friend asked me a very thoughtful question the other day: “Why do you observe at night?” I had been telling her about how I had been observing at night recently, explaining one of the reasons I hadn’t been around much. At first, she accepted that without much thought because of course you observe at night, right? Later, though, she asked me why we observe at night since radio telescopes can observe all the time. Indeed, one of the advantages of radio astronomy is that observations can take place all the time. While the Sun is a radio source, it is not bright enough to prevent other observations from occuring during the day. In fact, observations are scheduled on Arecibo around the clock. You can visit this link to see a pictorial representation of the Arecibo schedule. Downtime for maintennance of the telescope preferentially occurs during the daytime, as makes sense both for daylight and worker’s schedules. While observations can occur around the clock, ALFALFA observations occur at night (or only slightly before/after sunrise/sunset). There are two main reasons for this. The first is that the Sun can affect our observations. While it doesn’t drown the sky at radio wavelengths like it does in the optical, it is still a strong radio source. Since we observe with the telescope in a fixed position, the Sun moves relative to the receiver throughout the day. While we would avoid pointing the receiver somewhere it would cross the Sun’s path, it would come near the receiver at some point and a little bit of power would be registered by the very edges of the beam (the sidelobes). This would change the base power level (baseline) that we look for signals against. Since we are looking for very faint signals, having the baseline vary would make it much harder to find the galaxies we are interested in. The other reason for observing at night is that typically there is less RFI (radio frequency interference). RFI is generated because people use radio frequencies for communication. Since it is the result of human activitity, RFI is also often less of a problem at night. So, we will continue to observe at night in order to help us detect those very faint galaxies. And while I may complain about the late nights and daytime sleeping, I have to admit it wouldn’t feel like observing if it happened during the day. I guess that’s the optical astronomer in me.